New methane emissions research co-authored by Dr. Ghassem Asrar and published in Carbon Balance and Management, “Revised methane emissions factors and spatially distributed annual carbon fluxes for global livestock,” attracted international media attention. The majority of coverage was in the United States, where journalist Chris Mooney reported it in the Washington Post and it was widely syndicated. In the United Kingdom, reporting outlets included The Guardian and New Scientist. It was also reported by The Irish Times and Frankfurter Allgemeine Zeitung (print) in Germany, and AFP and Le Monde in France. For more information, view this link. 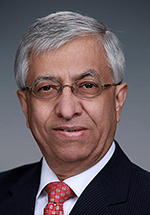 Asrar is the director of the Joint Global Change Research Institute, a collaboration between PNNL and the University of Maryland in College Park.